Platt Retail Institute reports the results of its latest study on attitudes regarding digital place- based advertising. The study reveals how advertising agencies perceive their clients’ attitudes and perceptions towards this medium as well as the decision-making factors involved in including it into the marketing mix. The findings are summarised below. As expected, the place-based feature of the medium was perceived as its strongest advantage by 30% of respondents. Another 30% of them appreciated the medium’s ability to support targeted, dynamic and engaging ads, while 15% of them showed enthusiasm for the ability to innovate supported by this medium. Comments were mainly focused on the medium’s features to attract attention and lead to action, as well as the technology’s flexibility and effectiveness (short lead time from message to screen). Even brands have still to learn about the potential of digital place-based media (DPA), report agencies. The study quotes one respondent according to whom ”It’s a teaching environment and we are trying to educate them”. – content creation costs (17%) and content development issues (12%). –38% of respondents mentioned metrics as a ”must-have”, given the fact that, at the moment, the industry lacks a broadly accepted set of indicators that measures the medium’s profitability & efficiency. Broad acceptance and adoption of metrics is another blocking point for the industry. 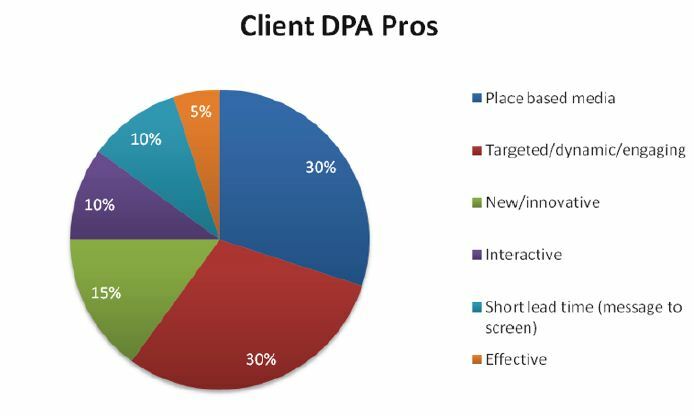 – 37% of the interviewed agencies considered case-studies highlighting the use and results of DPA as the optimum way to educate clients about the medium. 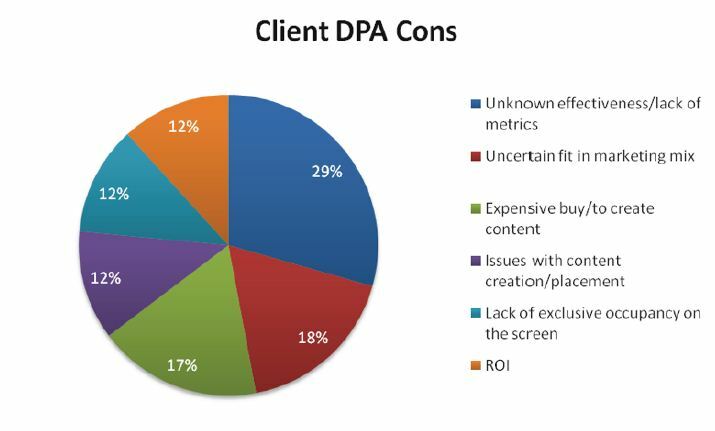 – 40% of agencies acknowledged that client’s attitudes and usage of the medium depends on how much they know and understand about it. Once they grasp its advantages and potential uses, they like it the research shows. The study consisted of a series of open questions that were then followed by extensive interviews with 20 individuals at leading advertising agencies. Platt retail Institute’s research was commissioned by Intel and supported by Digital Signage Expo and the Digital Place-based Advertising Association. We could argue that the findings aren’t surprising, reiterating the old postulation that there’s still a lot of work to be done on regulating the industry (though it wouldn’t be fair not to acknowledge Digital Screenmedia’s ROI calculator for its members, so some progress has been done on this front). The answers also portrayed the experts’ (and brands’) content- focus, despite the fact that technology is the backbone of the advertising effort and makes it happen. This shows that the ”technical bit” is a somehow secondary consideration, while the creative output gets the spotlight ( in a way understandable, since the ads influence viewers and thus the campaign’s results) when assessing the attractiveness of the medium. Nonetheless, when technology was mentioned, were were relieved to see that it was seen as flexible and effective. And in the end, why should we complain about it? According to Donald Norman (The Invisible Computer, 1998), the ultimate interface is invisible, you don’t even know how you’re using the technology. Platt Retail Institute’s research article can be found here. This entry was posted in Marketing and Advertising by Dynamax. Bookmark the permalink. Thanks Olya! Your feedback is much appreciated. Keep an eye on our blog for more interesting news!